If an employee feels he or she has experienced workplace harassment, the company may be held liable. Resulting lawsuits can prove quite costly to the employer. This makes proper precautions to prevent workplace harassment vitally important to business operations. To protect your employees from harassment and protect your company from lawsuits, take the following steps. Create a written policy: Put your workplace harassment policies in writing. Be sure to include clear descriptions of various types of harassment, what employees should do if they feel harassed, and what actions will be taken by the company if this occurs. Consult with professionals: To ensure your policy adheres to current laws, ask an attorney to review your statement. He or she can ensure that it clearly defines harassment and provides a complete picture of your policy. Your regional or district office of the EEOC is another good source for guidance in creating this written policy. Revise the handbook: Once you have prepared your written policy, make sure it is included in your employee handbook. Your handbook should also include an equal employment opportunity statement and an at-will employment statement. If necessary, revise the current book and redistribute copies to all employees. This may require some investment of resources, but it does no good to create a policy unless everyone is made aware of it. Train your employees: Make training on workplace harassment mandatory for employees. This might involve a video, presentation, or a simple meeting to review your policy. Ensure every employee fully understands your procedures for the reporting, investigation, and resolution of workplace harassment complaints. When employees complete this training, have them sign an acknowledgment form that states they understand the policy. Keep these forms in each employee’s file. Take immediate action: If an employee reports an occurrence of workplace harassment, act on the complaint right away. Don’t ignore it. Don’t put it at the bottom of the priority pile. Fully investigate any claim of harassment. Refer to your policy for proper protocols to handle the situation. An improper response can easily lead to a lawsuit or further incidents, so making the time is well worth the effort. An immediate response helps provide a safe work environment for employees and protects your bottom line. 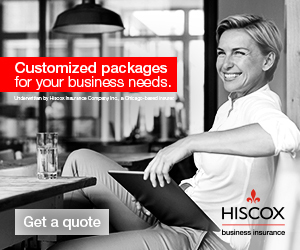 Switch and save on small business insurance with Hiscox! Our customers save 31% on average compared to other insurers. ​Put coverage in place: Employment practices liability insurance (EPLI) offers coverage in the event an employee files a lawsuit regarding workplace harassment. The policy covers claims regarding discrimination, harassment, and wrongful termination as well as other employment-related matters. This insurance can be written as a stand-alone policy or may be provided as a Business Owner’s Policy endorsement. ​Consult with your insurance agent to determine which type of policy and how much coverage are appropriate for your business.